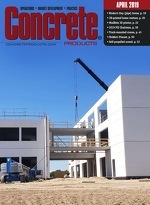 With an eye to making concrete delivery safer and more efficient, Con-Tech Manufacturing has developed the Power Chute, which eliminates the need to physically handle and swing mixer truck extension chutes. The component was unveiled at the National Ready Mixed Concrete Association’s 2018 ConcreteWorks conference and will be prominently featured at World of Concrete 2019. The premier Power Chute was shown at ConcreteWorks, ahead of duty in the Oklahoma fleet of Dolese Bros. The Power Chute consists of a main, foldover and four extensions that are permanently attached to the rear pedestal. The chutes are “nested” in the stowed position and can be deployed as required to achieve the necessary pour distance. Hydraulic cylinders fold and unfold the segments, while a hydraulic swing function allows the operator to control chute rotation to place the concrete as required. The position is controlled via wireless transmitter; it adds a level of safety by allowing the operator to be located away from the pouring activity or in the cab.